Howerton and Weeks [Ed. ], Spartan Books (AUGMENT,133183,). It must provide perspective for both long-range basic research and research that will yield immediate practical results. It must indicate what this augmentation will actually involve in the way of changes in working environment, thinking, skills, and methods of work. It must be a basis for evaluating and assimilating the possibly relevant work and knowledge of existing fields. It must reveal areas where research is possible and indicate ways to assess the research; must be a basis for choosing starting points and developing appropriate methodologies for the needed research. Artifacts—physical objects designed to provide for human comfort, the manipulation of things or materials, and the manipulation of symbols. Language—the way in which the individual classifies the picture of his world into the concepts that his mind uses to model that world, and the symbols that he attaches to those concepts and uses in consciously manipulating the concepts ("thinking"). Methodology—the methods, procedures, and strategies with which an individual organizes his goal-centered (problem-solving) activity. Training—the conditioning needed by the individual to bring his skills in using augmentation means 1, 2, and 3 to the point where they are operationally effective. those we call the composite process capabilities, which are derived from hierarchies containing both of the other kinds. As principal elements, the language, artifacts, and methodology which man has learned to use. 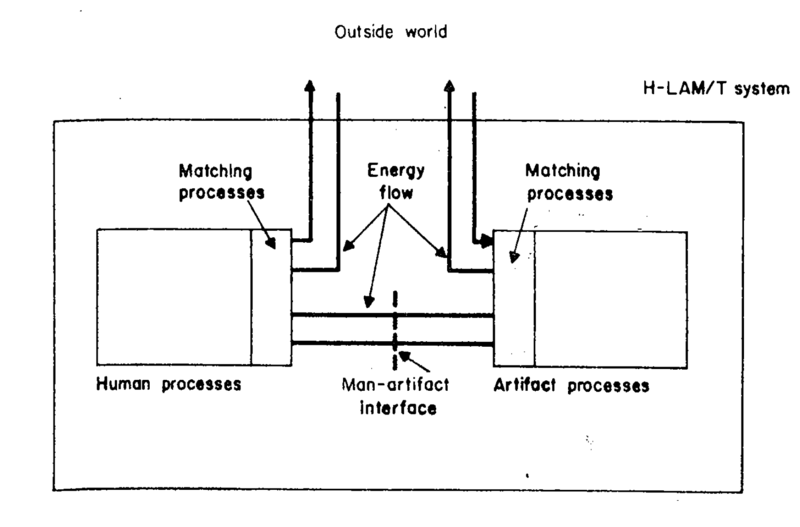 Dynamic interdependence of the elements within an operating system. A hierarchical system structure, best considered a hierarchy of process capabilities whose primitive components are the basic human capabilities and the functional capabilities of the artifacts, organized into increasingly sophisticated capabilities. As capabilities of primary interest, those associated with manipulating symbols and concepts in support of organizing and executing processes from which are ultimately derived human comprehension and problem solutions.